Skoda's Vision S concept is powered by a plug-in hybrid drivetrain and has space for three rows of seats. GENEVA -- Skoda's forthcoming large SUV will offer the best packaging in Europe’s large SUV segment, CEO Bernhard Maier told journalists at the auto show here today. Volkswagen Group’s Czech subsidiary used the show to unveil the 4700mm-long Vision S concept, which offers room for six over three rows. “With Skoda you always get more car for your money,” Maier added. The production version of the SUV is expected to debut at the Paris auto show in September, according to German media reports, which said the new model would start at 24,000 euros and be made a Skoda’s plant in Kvasiny, Czech Republic, alongside Seat’s first SUV, the Ateca. Skoda has spent 7 billion crowns ($280 million) to increase capacity at the factory to 280,000 cars, up from 150,000, the automaker said. Skoda officials, however, decline to reveal its plans for the new model, which would join the compact-sized Yeti as the brand’s second SUV. 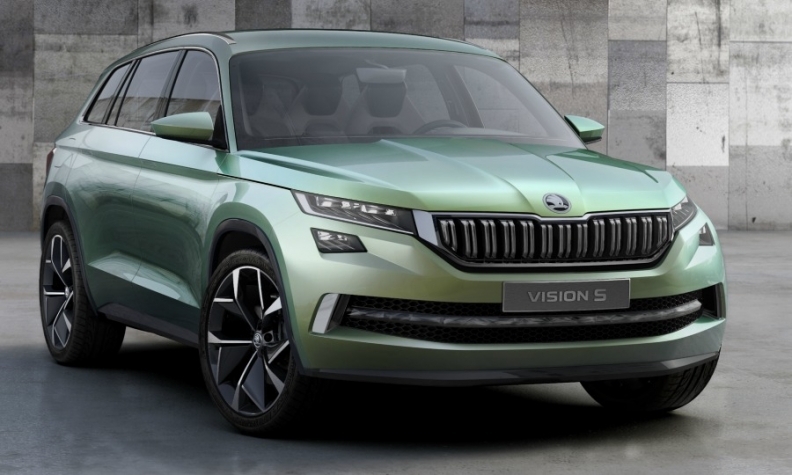 Market watchers at JATO Dynamics are bullish about the Skoda model’s chances in Europe, where 70 percent of sales in the large SUV segment come from higher-priced premium brand such as BMW and Mercedes-Benz. He also sees Skoda’s offering taking sales from volume models such as the Hyundai Santa Fe. Skoda’s concept is powered by a plug-in hybrid drivetrain that mates a 1.4-liter gasoline engine with an electric motor. Skoda will launch a plug-in hybrid car in 2019, Maier said without saying which model would get the technology. An electric-only model would follow the plug-in hybrid, the CEO said. The concept’s plug-in hybrid offers a combined 222 hp from the gasoline engine and its two electric motors, one for each axle. Skoda claims the car can accelerate from 0 to 100kph (62 mph) in 7.4 seconds and drive up to 50km (31 miles) on electric power alone. Technology on the concept includes wireless charging for smartphones. That feature is also offered on the new Ateca.